People have gotten more creative with the shapes of modern pool designs for yards of all sizes. Rather than settling for a rectangle or the popular kidney shape, consider designing something that is meaningful to you. There are so many features that can transform the average swimming pool into a breathtaking entertainment oasis. From pool bars to water slides, your swimming pool feature options are endless. If you are looking for a simple, cost-effective, and functional feature to make your swimmers say WOW!– pool lighting is your answer. Cooking out by the pool while the kids are swimming enjoying time with family and friends in and around the pool. A dinner party out around the pool is a great causal setting for making new friends and reconnecting with old ones. There is nothing more soothing then sliding into your swimming pool after a hard day at work. The sound of falling water a cool drink to make the days challenges a distant memory. This is a word that has gained popularity since the early 2000s, mainly as a result of 9/11. Simply put, people are traveling less and spending more time at home. The more we find enjoyment through staying home, the more money we save on the natural expenses that come with any type of travel. With all the new technology of the information age, families are being constantly pulled apart by a mountain of activities and ‘distractions’. Such is the beauty of swimming pool ownership-no distractions. Only smiles, games, and the sound of laughter. A Dixie Pool – more than just a pool – an Outdoor eXperience! Dixie Pools has been in business 44 years in this fast paced world where companies come and go we have stood the test time and so have our pools. With over 10,000 pools in the ground and 44 years in business you can be assured your pool will last. We offer some of the best warranties in the swimming pool industry, 3 years parts and labor on Hayward pool equipment that we install. A lifetime warranty on the swimming pool shell for details on this warranty please contact Dixie Pools office. Pool and spa professionals are becoming more proficient at creating energy-efficient plumbing systems. “Within the past 10 years, there has been a marked improvement in the industry as far as builders creating more efficient plumbing design, The hydraulics are key for creating and energy efficient design. However, there are still some fairly common missed opportunities for energy savings when it comes to the equipment pad. With technology pools are far simpler to maintain than in the past with salt systems handling the majority of your chemical needs, and pool cleaners vacuuming the pool and control systems on your phone that allow you control of your pool from anywhere even signaling and error code when there is a problems pools have never been easier to operate and maintain. All Dixie Pools are constructed with safety in mind. Dual Main drains to prevent suction entrapment all pool vacumn lines come with a self closing latching door. These are all things we recommend to make owning a swimming pool safe and fun for the whole family. • Keep children under active supervision at all times. Stay in arm’s reach of young kids. Designate a responsible person to watch the water when people are in the pool—never allow anyone to swim alone. Have young or inexperienced swimmers wear a U.S. Coast Guard-approved life jacket. • Ensure everyone in the home knows how to swim well by enrolling them in age-appropriate water orientation and learn-to-swim courses from the Red Cross. • Keep your pool or hot tub water clean and clear. Maintain proper chemical levels, circulation and filtration. Regularly test and adjust the chemical levels to minimize the risk of earaches, rashes or more serious diseases. Whatever the scope of you project/investment, Dixie Pools offers various financing options to help make your Pool & Spa dreams, a reality. 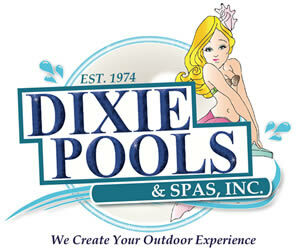 One more way that Dixie Pools & Spas is Creating Your Outdoor Experience! Swimming pool lighting is incredibly beneficial for all types of pools. Aside from lighting up your pool and making it a beautiful focal point on your property, swimming pool lighting increases the safety of your swimmers – especially at night. Being able to take a swim in the evening is one of the luxuries of owning your own swimming pool, but it’s important that you have a well-lit path and clear understanding of the water and surrounding areas. Depending on where you live, dangerous wildlife (like snakes) may sleek into your pool unknowingly. By lighting the interior of your in-ground pool or installing walkway lighting on your pool deck, you are increasing the safety of your guests and the value of your property. Fire on water creates a centerpiece for conversation as well as a spectacular element for your own enjoyment. It doesn’t take much – a source of energy (propane or gas) and a little bit of elbow grease to build the décor. This can be added onto any pool to give it a warm, exciting glow that also helps make it a beautiful place, even in winter when it’s too cold to swim! The sound of falling water over any surface and spilling into a pool below captures everyone’s attention and sends their imaginations soaring. Transport to a jungle or beneath a cliff every time you head to the pool with your own miniature version of one or more waterfalls in your design. You don’t need a lot of room, either, making it a great choice for modern pool designs for small yards. There is always and endless source of things to do with a swimming pool in your backyard. Games such as volleyball, basketball and Marco Polo come to mind quite quickly. Just as it is fun to collect things that sink to the bottom, you can do the same with things that float. Ping pong balls make a great floating thing to catch since they’re light and hard to see. You can put numbers on them for point values, initials on them where players need to find just their own, etc. The more you toss into the pool the more fun it is. Get a collection of items that will sink in pairs. (2 coins, 2 pool rings, 2 dive toys, etc.) Toss them about the pool and then have the teams try to collect one of each item. First to collect them all, wins. Although many adults buy swimming pools for the fitness component, most don't realize that their children will likely benefit much, much more in this area. Every summer, my children undergo a physical transformation from the end of spring to the end of summer. This is because they've usually gained a little bit of extra weight due to being inside so much during the winter and then they find themselves playing in the pool 3-5 hours a day once the summer is in full effect. Instead of being bored and looking for a snack in the pantry, they instead turn their focus to creating new and exciting games and activities in the pool. And the beauty is that EVERY activity they do in the pool involves exercise of some shape or form. 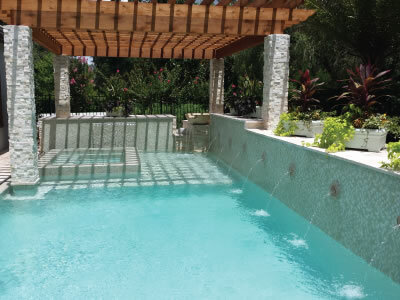 When customers debate over whether or not a pool will be a good investment, they need look no further than the fact that being in and around a pool is easily one of the most natural stress relievers in the world. There have been many times when I've been under pressure from the typical stresses of being a husband, father, and business owner only to find my worries washed away as I toss my kids in the air and watch their laughter as they splash into the water. This is a benefit that most parents have never thought of until they actually own a pool. As many parents are well aware, it can be difficult to get children to bed on time, especially during the summer. This is because they can tend to get just a little ‘wrung up' during this exciting time of the year. And so what's the cure for this dilemma? Well let me assure you that nothing will tire a child our more than playing outside in the pool all day. In fact, instead of me shouting commands, my kids will often tell me that they are going to bed during the summer. How about that for a benefit?! This benefit isn't necessarily for everyone, but it's one that my family has embraced since we had our pool installed 4 years ago. We've had multiple church and youth group activities in our pool that have lead to many wonderful experiences and stronger relationships with other persons that we may otherwise not have had. I am a stronger believer that pools bring families and friends closer, and such shall always be the case as we continue to extend our blessings to others. A Reason to Stay Home When it comes down to it, many parents worry about what will happen to their children the older they get and the more time they spend at their friend's houses versus their own. This being said, swimming pools are a wonderful incentive for children, and their friends, to stay home (your home) versus going other places. And trust me when I say it's comforting to watch your children relate to their friends as they grow from little kids to young adults.